Iwonder how many of you have ever opened a split shot sinker with yourteeth or held one in your mouth when going through your tackle box. Iam pretty sure most of us have without giving it a second thoughtbecause we were focused on the fishing. Lead is a toxic substance andcan be harmful to humans in many ways, according to federal and stategovernment agencies in the U.S.A and Canada. Knowledge of this haslead to a ban on lead based paint, and as a fuel additive, and alsohousehold plumbing pipes, and window coverings the list goes on. Herein Canada Shotgun shells with lead shot are now banned, and only nonlead shot may be used. Many efforts have been made towards publicawareness about the hazards of lead and many people are aware of therisk.Howeverthere is a lot of work still to be done, you see humans are not theonly species who suffer from the effects of lead, many of our CommonLoons suffer a terrible death every year due to lead poisoning. A Split shot Sinker inside a dead Loon! Atleast 27 different species are known to be affected by lead poisoningincluding numerous duck species, the Trumpeter, Tundra and Muteswans, Bald eagles, Sandhill cranes, and the Common loon.Studiesconducted in the late 1990's and early 2000's in New England and NewHampshire and Minnesota found in some areas over 50% of loonmortality is due to lead poisoning from sinker and jig ingestion; andis the most frequent cause of loon deaths in New Hampshire. Up to 17%of the loon deaths in Minnesota were the result of lead poisoning. Here is a big sinker a loon consumed from some sort of fishing rig. 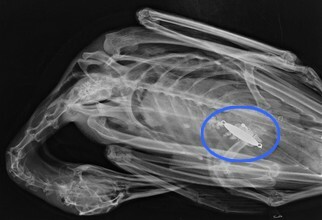 This is a closeup shot of the above photo, look at the sinker the bird consumed. This is obviously some sort of rig that was broke off from an angler. 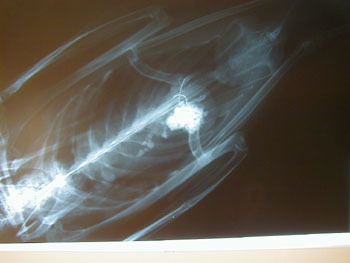 Likewise the Canadian Wildlife service has shown significantmortality in the Common Loon from ingestion of lead sinkers and jigs.I have looked into this several times, the numbers are real, this isa serious issue and one we have to work on.Thereare many documents that clearly warn of the risks of lead toxicosisin water birds. Direct ingestion rather than other environmentalsources are clearly the leading cause of lead poisoning in our birds. 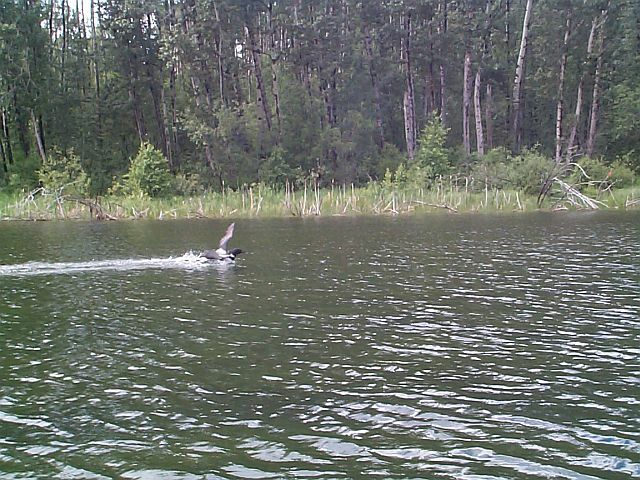 This is another sinker from a broken fishing rig, and another dead loon, these photos are just a drop in the bucket, there are many such photos. Some are very disturbing, showing the birds dying. Boattrauma, commercial fishing nets, botulism, mercury, aspergillosis,and others round out the beating our water birds take every year.Hereis what happens in most cases, birds commonly pick up small pebblesto grind food for digestion. 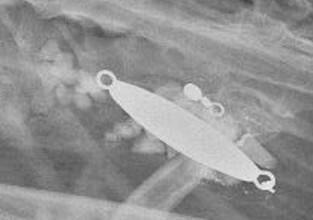 Small lead sinkers and jigs are oftenmistaken for pebbles, or the bird consumes lures with fish and leadattached directly.Thelead enters the gizzard, where stomach acids and abrasion break downthe metal and it is absorbed into the bloodstream. What happens nextis a real heart breaker, if you love the outdoors as much as I do.The poisoning then causes behavioral changes in the bird includingloss of balance, gasping, tremors, and an impaired ability to fly.Nowthe bird is more vulnerable to predators, it has trouble feeding,mating, nesting, and caring for its young. 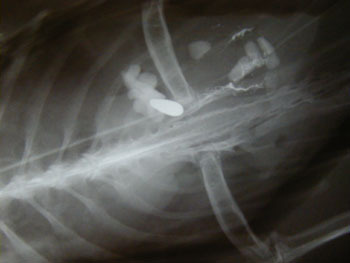 It becomes emaciated andoften dies within two or three weeks after eating the lead. Just onelead sinker or jig can poison a water bird, and make it suffer. This is the way I like to view the Loon. I amnot a crazy environmentalist, or one of those over the top goofs whogo to far to the extreme to discuss a problem. I love the outdoorsand Fishing and Goose hunting just like all of you. What I want todiscuss here is how can we help and do something without hurting thefishing Industry. How can we help and how can we as fishermen andwomen work together to better our sport and the outdoors we lovewithout getting the Crazy people to take up the cause and want a banon fishing products. Lets face it there are some of those politicianswho would love to cut into our Fishing heritage and destroy it.Leadhas always been the sinker and jig material of choice because of thedensity and the cheap cost to the manufactures. However there aresome very high quality non-toxic sinkers and jigs out there made outof a variety of different metals. Like Bismuth, Tin, and Steel, toname a few. 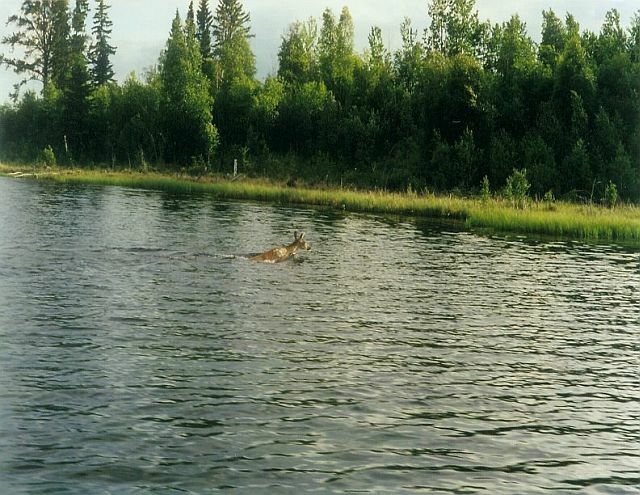 A Deer swimming by on it's way across the lake, I enjoy these moments when fishing. Would a ban on Lead fishing products help?? And Mygoodness who would first of all, and could it ever be enforced? Ourcountries are struggling with major budget deficits as it is, sothere is really no money to enforce such a thing. It would only hurtthe industry as I see it. Different metals are available, and easy towork with, Bismuth is so very easy to work with and has a density86.4% of that of lead and is a great emitter of sound like steelHowever steel is a little harder to work with but nonetheless is agreat metal for sinkers. Tin is the hands down best for pinch on, andsplit shot sinkers because it is so pliable. And the non-toxic paintsthese days are out of this world. Professional anglers have commentedon the quality and durability of these products, and are starting tochange the way they look at lead products. However to ask amanufacturer to retool and go lead free would be crazy and cost somecompanies millions, and could put some out of business. And so likethe lead, the issue is toxic also, and a very difficult thing to tryand work on. We should really ask ourselves what our environment andour waterfowl, fish, and wildlife are worth to us and make somechanges in the way we fish and the way we teach our kids to fish.There has to be a way we can make a difference and help out withoutgoing to some extreme. Can we adopt different techniques and stylesof fishing? Can we use a super-line to help prevent break-offs? Therehas to be a way we can support the industry and make sure we don'tleave a mess of product in the water that could end up in a bird. SoI think it boils down to us as individuals, ask yourself What Can IDo? I really think this issue comes down to us and if we take chargeand show we care, the radical groups will not have a leg to stand on.I am going to experiment with new systems and presentations to see ifthere is a new way I can fish more efficiently and make less of animpact on the lake. Can we leave less out there? Oh yeah I think so,and in the case of lead, Less is more in this case. I look at thework Ducks Unlimited has done over the years and I just marvel at howwonderful that organization has been and the amazing work they haveaccomplished. I know if we all work together, our outdoor resourceswill last for generations and continue to be a great heritage we passon to those coming up behind us.